A fantastic hand carved laminated wood stool. An alluring and unusual 3-legged form of clear zoomorphic intent with stylized mammalian legs seemingly ready to pounce. Wonderful from all angles with great, subtle detail throughout. Unexpected and well-crafted, a unique, organic utilitarian element. A wonderfully stylized and modernist sculpture signed "R.D. 1938". 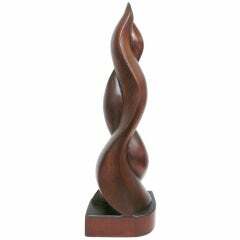 This piece evokes a strong WPA feel and captures the spirit of pre-war American abstract sculpture. Pair of hand-carved wooden stools. With goat hide cushions. 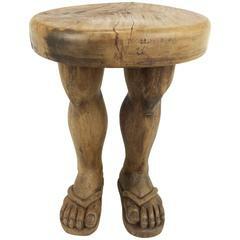 Hand-carved solid wood Folk Art stool in the shape of two legs, sandaled feet and thick wood disc seat. 1910 Ashanti tribal stool. This stool was used by the tribal leader's wife. Carved wood capital that has been upholstered with black leather transforming it into a wonderful place to sit or put's ones feet on. 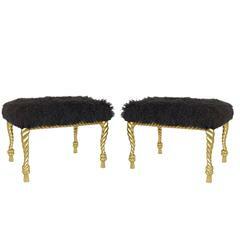 Great accent piece to tuck under table or console.